A Random Look at Vlambeer | SPACE-BIFF! Vlambeer, a small (two people!) Dutch game studio, released their latest game earlier today. 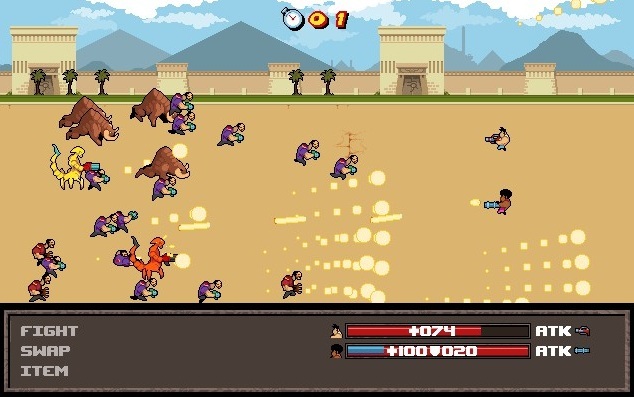 Serious Sam: The Random Encounter is the most recent in Croteam’s series of indie versions of their Serious Sam franchise, and can be had for only five dollars from Steam. Their games have a strong history of being innovative changeups of familiar genres, and The Random Encounter is no exception. Thoughts on this, and their past games, below. I don’t think I’ve ever met a “fixed shooter” that I’ve gotten along with — their appeal confounds me. Until Super Crate Box, that is. SCB elegantly reforges the whole genre with just a couple fundamental changes. It appears fairly generic at first. 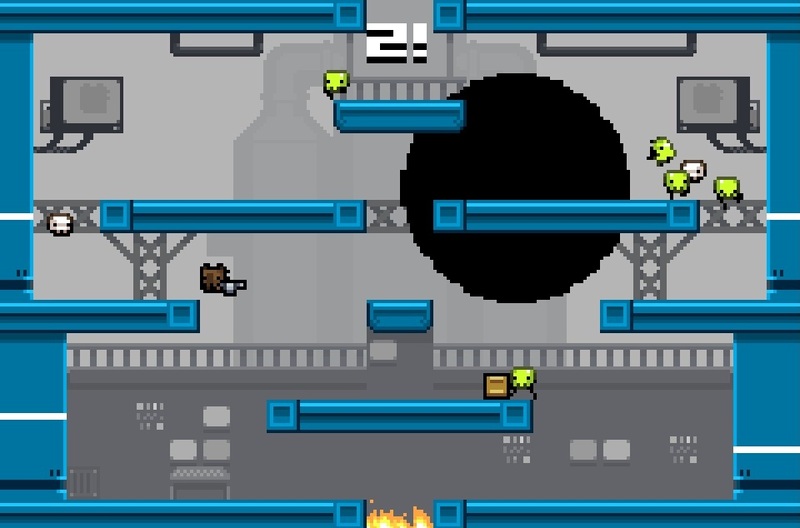 Enemies appear from the top and walk along walkways until they reach a pit of fire at the bottom. Now, if this were a normal fixed shooter, you would score points by shooting the monsters. 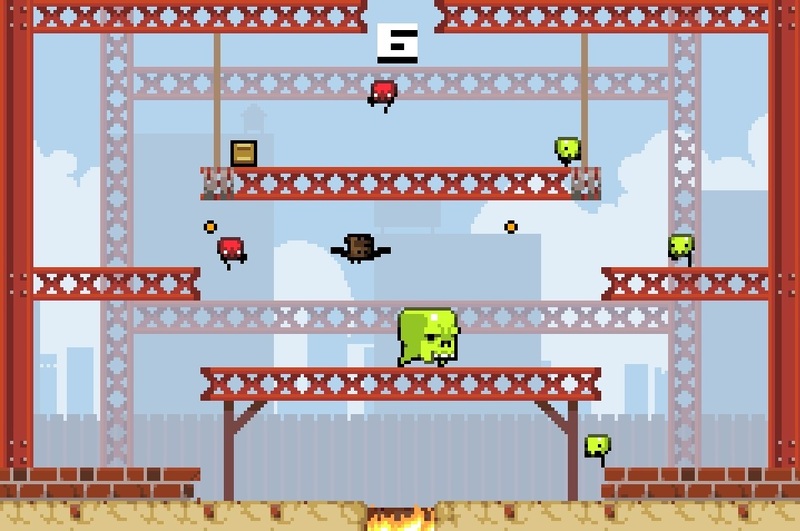 Since this isn’t a normal fixed shooter, the monsters are just there to hassle you, reappearing back at the top of the screen in angry mode if you let them reach the fire. Instead, you score by picking up the crates, with the caveat that you have no idea what weapon you’ll be picking up when you do. It could be a fairly normal weapon, such as a set of dual pistols that let you shoot weak bullets in both directions or a powerful but short-ranged shotgun. Or it could be something a bit more eccentric, like a laser rifle that has to charge up before it fires but then can punch through all enemies in the path of its beam, or a bouncing disc gun that chops anything in its way in half — including you. None of the weapons are worthless. In fact, all are exceptional under the right circumstances. But you won’t be picking up those weapons under the right circumstances. Mines may be great for blocking the final stretch to the fire pit, but you’ll just as likely find yourself carrying them when flying skulls are after you. The machete is good at turning back the bigger enemies before they hit you, but you’ll be carrying it when swarmed. And with the flamethrower you’ll be laying down fire left and right to torch the little guys only to find your feet burning, making it impossible to jump out of the way of the big red monster that doesn’t really mind the heat. 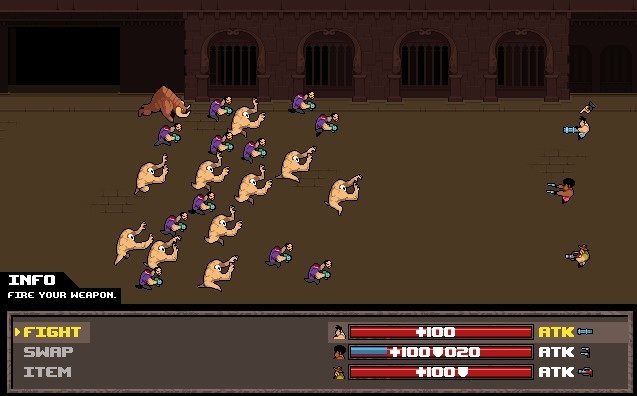 The game quickly becomes one of prioritization: do you wipe out that new string of enemies, or do you run over to the next crate and risk getting a useless weapon that will let the monsters slip past, turning into their red forms? Do you take the long way along an upper walkway, risking the path where enemies converge, or do you try to jump over the fire only to fall in, again? I’m no good at this one, but I recommend it, especially since it costs exactly zero rai stones, or whatever other currency you trade. You can download it here. 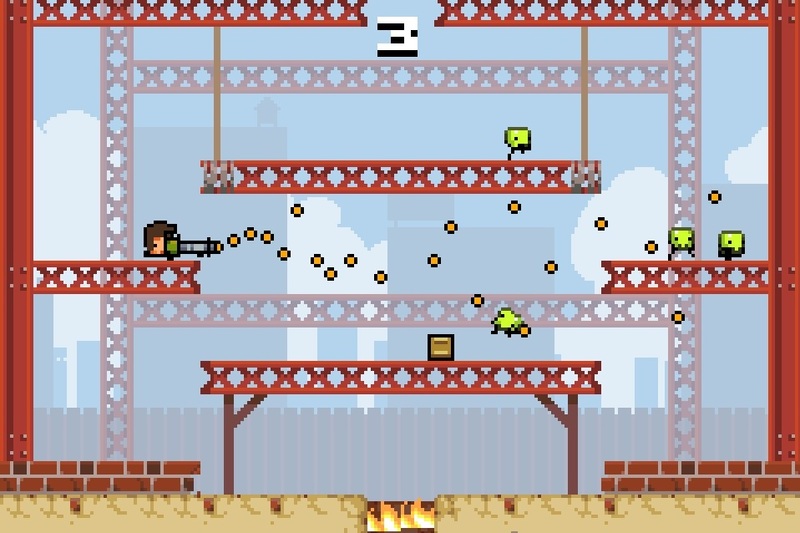 This is the only Vlambeer game that I wouldn’t give a wholehearted recommendation for. Which isn’t to say it’s bad — its whole basis being to purge a body of water of all life. At least that’s what I’m assuming, since you catch fish dozens at a time, launch them into the air, and shoot them before they fall back to the sea. This is how you earn your wages and high scores. As such, I’m not sure what else to say. It sure is the most radical version of fishing I’ve ever experienced. Or heard of. It seems to be a variant of the more-recently invented “toss game” genre, in which you launch a turtle or penguin or bull wrestler as far and fast as possible, eventually buying upgrades to launch them farther and faster. Except instead of launching animals, you’re sinking a hook. Still, the basics are the same: you earn more money by traveling farther, and you then spend that money on upgrades that enable more travel. It’s engaging enough for an hour-long Flash game (best played on Kongregate), the type of game to play when heartbreakingly bored. With clear character motivation, Sam goes through time to take down Mental. 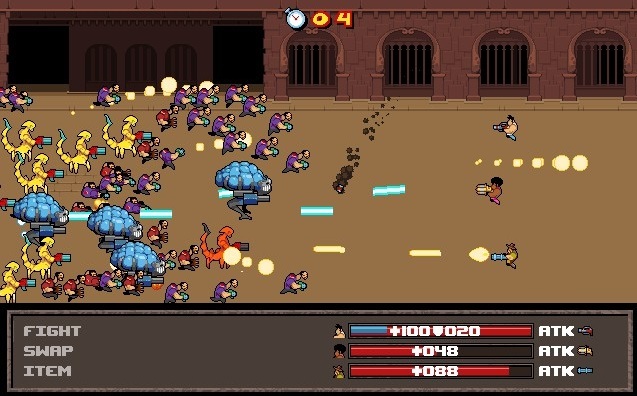 This involves moving around a map and solving puzzles (such as picking up the plainly-visible key to open the not-hidden door) that will earn complaints from the characters, who would rather be running backwards while shooting at hordes of monsters. As you travel, you will enter random encounters (hence, the name of the game) with Mental’s mutant/alien goons, á la the JRPGs that run through our collective childhood memories. The battle mode is a delightfully haphazard cross-pollination between those childhood RPGs and the Serious Sam run-backwards-while-shooting technique. You will be permitted to plan a move for each manly man, such as firing a gun or using an item (medkits, armor, revive, etc). The guns themselves perform different useful actions: magnums fire upon whatever abomination is closest to our heroes, while miniguns drive a concentrated barrage of freight-train bullets in a straight line of your choosing, and a laser rifle slows an enemy’s mad rush. The various weapons are pleasingly distinct, providing a surprising amount of depth. Once you’ve assigned each hero an action, the round begins. The planning phase of battle, with text menus and health bars and EVERYTHING! When I was a kid, my dad finally buckled and got me Doom for the SEGA Genesis 32X. My mother was horrified. I insisted that there was an art to it, a series of techniques that resided in movement and weapon selection. She remains to this day unconvinced. It’s systems like the one that Vlambeer has cobbled together here that leave me a swelling sense of vindication. Once you’ve selected your weapons and firing-lines, you have nothing to do for five seconds but watch while your heroes run backwards while firing madly at the approaching horde. Nothing to do, that is, but move your group up and down, trying desperately to spread out the damage they’re taking and keep their shooting lined up with enemies. Five seconds of pure ballet, dodging mixed with maximum damage-dealing. And it interacts perfectly with the RPG-lite ordering system that interrupts the fight after those five seconds are done. It’s not perfect. There are times when I’m not sure why I’ve won or lost a battle, and the hordes you’ll face are so huge that they can be extremely tricky to keep track of. But, as with Super Crate Box, Vlambeer has taken the parts of something ordinary and well-traveled and tinkered it into some sort of truly unique clockwork beast. 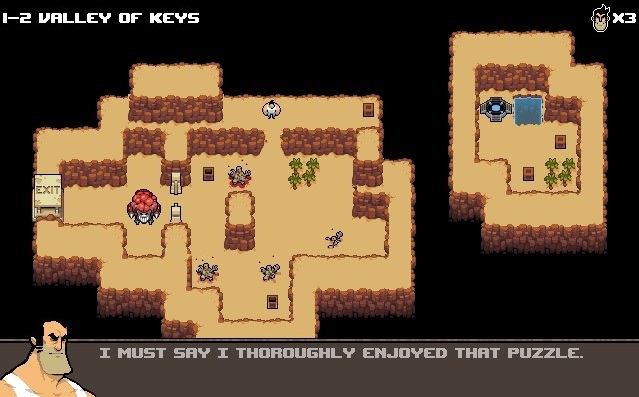 Like all their other games, The Random Encounter is basically only playing one note over and over again, but it does it with such panache and a sense of lightheartedness that it hardly matters. It isn’t the kind of game that I’m going to play for dozens of hours, but it’s one that I suspect will find its way back onto my HD every so often. For less than five dollars, it’s a bargain. Posted on October 24, 2011, in Indie and tagged Indie, Serious Sam: The Random Encounter, Super Crate Box, Vlambeer. Bookmark the permalink. Leave a comment.